Picked up the press release last night. Seems to be for a good cause – the recovery of New Zealand and the Christchurch region after the tragic earthquake of February 22. “Blog4NZ is a grassroots blogging and social media effort to support New Zealand travel in the wake of the Canterbury earthquake. Calling all travel bloggers to join Blog4NZ. The face book page is: Blog4NZ – Blog for New Zealand on Facebook. The world is in shock that one of the premium travel destinations in the world could suffer such a natural disaster as happened two weeks ago in Christchurch. And while all our thoughts go out to those people who have lost loved ones, lost homes and businesses, travel bloggers around the world are uniting to tell the world New Zealand is a great place to travel and there is no better time than now. March 21, 22, and 23 has been set aside by travel bloggers throughout the world as 72 hours of content generation about travelling to New Zealand. #Blog4NZ is the brain-child of New Zealand travel bloggers Jim McIntosh and John Reese. John himself living in Christchurch. “We want a total black-out of travel content across the world, we want Twitter dominated by Tweets about travelling to New Zealand, we hope that all travel bloggers rally behind this cause and publish as many articles as possible throughout this period about travelling to New Zealand” said event organiser Craig Martin of Indie Travel Media. via Press Release: Calling All Travel Bloggers – #Blog4NZ | Blog4NZ – Bloggers Resources. This photo has always impressed me. A fantastic view from the International Space Station. Locals will recognise our prime wine growing areas of the Wairarapa, Blenhiem, Nelson, Waipara and Canterbury. It also reminds me – I saw some god botherers in our street the other day. They stand out like a sore thumb, don’t they? However, they must have got the message. 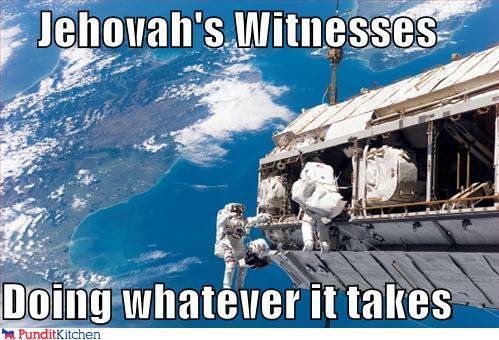 They seem to have stopped knocking on my door. Thanks to Pundit Kitchen: Would You Like A Copy Of The Watchtower?! You have got to love this. Astronauts/Cosmonauts hard at work on the international space station (ISS/Zarya) while passing over some of New Zealand’s best wine regions. In the North island we can see the Wairarapa/Martinborough region. In the South Island the Marlborough, Nelson, and North Canterbury/Waipara regions. 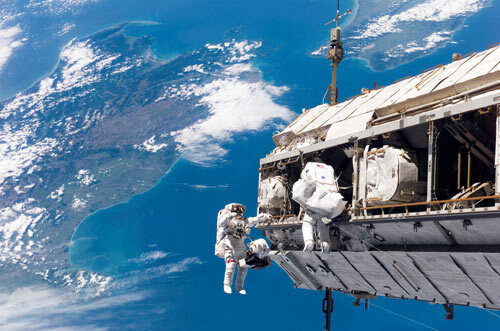 The coming Saturday and Monday evenings should provide good opportunities for observing the International Space Station from the North Island of New Zealand – weather permitting.